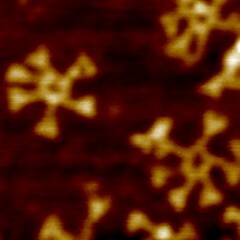 This atomic force microscopy image shows hexameric RNA nanostructures built using a tiny machine called the phi29 DNA-packaging nanomotor. The nanomotor (modeled after a natural virus that infects bacteria) successfully attached six triangle-shaped structures to each RNA molecule. These nanostructures are important building blocks for the development of nanomedicines programmable by size and shape that can deliver drugs specifically to cancer cells. The ultimate goal of this work is to decipher the optimal shape, size, elastic modulus, and targeting motifs that will most effectively deliver gene therapies and and chemotherapies to cancer cells.